I love make at home versions of my favorite foods and Life Your Way recently shared some of her favorite make at home pantry staples. It is a great list with a lot ideas. This Carrot Cake Jam sounds very unique and very good. I love homemade jam, so I might just have to give this one a try. French toast is one of my favorite breakfasts. I have loved it since I was a kid and this Coconut French Toast looks so good! A few weeks ago I had the opportunity to watch a live interview, and tour of an egg farm, as part of the Good Egg Project. And of course since we home school my kids watched it with me. They had fun watching it and learned a lot. If you have kids that love to learn they will probably love this farm to table video about eggs. It is a fun way to teach your kids about eggs, where they come from, and also a little bit about a farm and how it works. If you all love canning jars as much as I do, you need to check out this post my friend Jen did on 50 ways to use mason jars. I love these ideas! You all know I love menu planning, well Ziplist now has a menu planning feature that I love. It now allows you to not only add your favorite recipes to your recipe box, but you are now able to also make a menu plan using those recipes. And don’t forget their shopping list feature it makes shopping easy as well. This Greek Quinoa Salad from Two Peas and Their Pod looks really good and healthy. I need to add this to my must make list for the summer. Erin from $5 Dinners and One Dish Dinners shared a Cheeseburger and Fries Kebabs recently that my kids would love! And really anyone would love these. Who wouldn’t like cheeseburgers and fries on a stick. I love my rice cooker and this recipe for rice cooker risotto from Finding Joy In My Kitchen looks like one I will have to try. You all know I love homemade pudding and my sister recently shared a very quick and easy recipe for homemade pudding on her site. I love this idea for chocolate pudding. 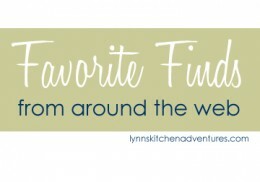 What fun food finds have your found around the web recently? Thanks for sharing my Carrot Cake Jam post with your readers! I hope you enjoy the recipe if you try it! You are welcome. It looks really good!